When the 2008 MotoGP season burst into action, it had been two years since Valentino Rossi had ruled as the World Champion - both 'The Doctor' and his Yamaha team had had enough of being second best. The second year of the 800cc era saw the tables turned, as Rossi imposed his speed, skill and personality on the championship. He emerged triumphant, dominating 2007 World Champion Casey Stoner and the rest of the 18-strong field as he raced to victory after victory, and yet another World Championship. Throw in the added spice of four ultra-quick rookies with a total of five World Championships between them - Jorge Lorenzo, James Toseland, Andrea Dovizioso and Alex de Angelis - and MotoGP 2008 took motorcycle racing to a new level. 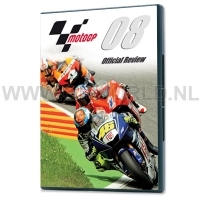 The Official DVD Review brings you the full story of the challenge for the title, with amazing action footage from every round, interviews, behind-the-scenes features and special features, including an exclusive interview with Rossi and complete on-board laps of all 18 circuits featured in the 2008 MotoGP campaign with the likes of Toseland, Edwards, Pedrosa, Hayden and more.